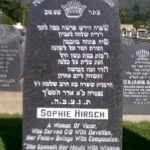 Ida Hirsch daughter of Rabbi Mayer Tavi Hirsch of SF married Abraham Pinchas Nasatir in 1929 who was one of leaders of the Orthodox Comunity and served as a Proffesor of History in the University of San Diego CA. Prof. Nasatir Died January 20 1991 at age of 85, see full Bio. the above date is wrong. 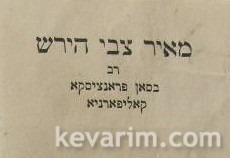 the Hapardes is wrongly id’d by our freinds @ Hebrew Books. Unbelievable. I encountered some s’forim in Lakewood with R’ Mayer Tzvi’s stamp several months ago, and just now sent pictures of the stamps to a friend in San Francisco, and I come across this! Anyone with information on this intriguing figure from my hometown. 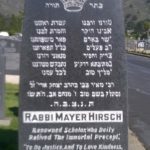 Rabbi Mayer Hirsch, leader of San Francisco’s congregation Anshe Sfard, was born in Lithuania and ordained a rabbi there when he was eighteen years old. After he immigrated to the United States, he first worked as a rabbi in Denver and then, when he was 33 years old, he came to San Francisco. Besides being a rabbi at the city’s Anshe Sfard, he also served as a rabbi at congregations B’nai David and Keneseth Israel. In addition, he became recognized as a leading authority in ancient Hebrew literature and Jewish philosophy. He and his wife, Sofie Rodinsky, who died in March 1960, had five sons and four daughters: Samuel, Morris, Max, Joe, Benjamin, Esther Hirsch, Rose Hirsch Goodstein, Rebecca Hirsch Schwartz, and Ida Hirsch Nasatir. 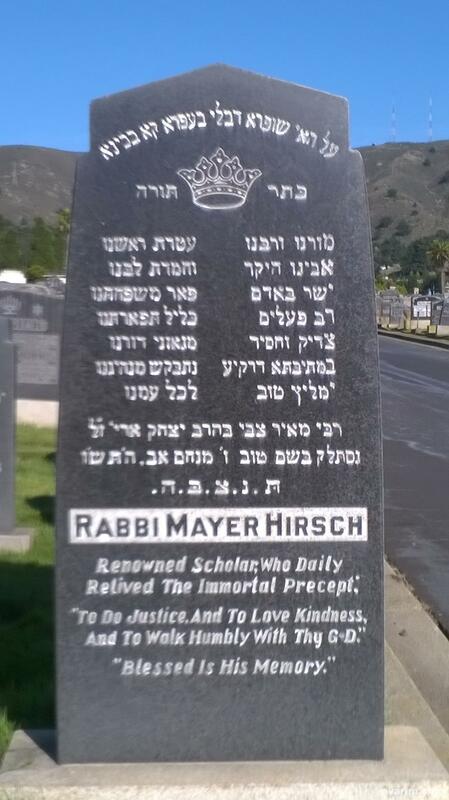 Mayer Hirsch died August 3, 1946, at the age of 72 years. During World War II, President Roosevelt appointed Mayer’s oldest son, Samuel (July 31, 1902 – March 29, 1985), as a military chaplain for the combined military services throughout the western United States. During and after World War II, he also met many Jewish refugees at the San Francisco docks, provided their entry bonds, and helped them find shelter and food. As a vice-president of the Hebrew Immigrant Aid Society (H.I.A.S.) in San Francisco, he greatly assisted the immigration of Jewish refugees to the United States, particularly those from Shanghai. Samuel, who was ordained a rabbi in private, served as a rabbi for various California synagogues, including Adath Yeshurun, in Stockton, and Chevra Thilim, in San Francisco, from 1966 to 1985. Samuel was also a member of Zionist organizations and promoted Jewish education as a member of the governing board of the Jewish Education Society; a founder of the Children’s Synagogue; and as a vice-principal and teacher at Central Hebrew School. He also worked as a rug merchant. My Baba’s brother, went to 25th ave. Schul. (They didn’t call it Chevra Thilim…just 25th ave. ) They knew Rabbi Hirsh very well. My family bought Kosher Le’Peash wine from him for our Seders. I still have a bottle of Slivovitz Plum Brandy, with a long passage written in Hebrew+Yiddish, and certified Kosher by Rabbi Hirsch. I remember my Great Uncle bringing the large bottles of wine to our Seders and sometimes would hear he and my Zaida joking, that if the wine wasn’t quite up to their taste….Rabbi Hirsch must have watered it down. My dads family came from Stockton, while my moms were all from SF, and grew up in the San Bruno Ave. Jewish Community. They got to know Rabbi Hirsch when they moved to the Richmond . Rabbi Hirsch is my great grandfather. His son Morris is my grandfather. Morris’s daughter Marcia, who was raised in SF, is my mother. I now live in the Richmond in SF and teach law at UC Hastings College of the Law. I would love to touch base with anyone who knew my great grandfather. I just found a very interesting photo of the rav. How do/can I post it? RH, email pic to the Admin, or upload to picasa or photobucket and paste here the link. Looking forward – Ty! 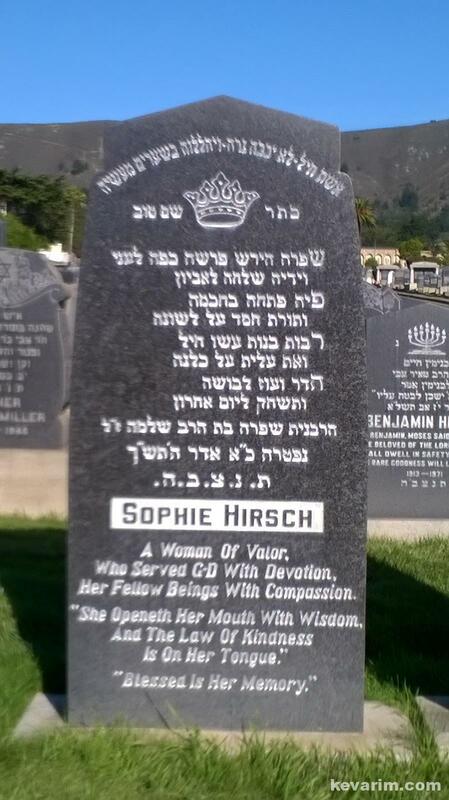 Rabbi Hirsch married my paternal grandparents in San Francisco in 1919. I have located Rabbi Mayer Zvi Hirsch’s kever and will photograph it, hopefully, on my next trip to San Francisco in about a month. I am also trying to prepare a short article on Rabbi Hirsch, so I would be thrilled if anyone with any recollections, papers, etc. would contact me. My e-mail is my last name, followed by the number zero, at G-mail. Rabbi Mayer Hirsch with barrels of sacramental kosher wine during Prohibition. from @ 1910-1920. I believe he was the father in law of R. Mayer Hirsch who was married to Sophie Radinsky. Since R. Hirsch made sacramental wine…I imagine his father in law might have been instrumental in ensuring that it was kosher. Please get in touch. I find a R. David Radinsky in Seattle, is it the same one? My Gret Grandfather was Rabbi David Radinsky, who’s daughter was Sophie who married Rabbi Mayer Hirsch and my grandmother was Sophie’s sister Eva Radinsky. Eva married Samuel Herzberg, who I was named after. Rabbi Daivd Radisky grew kosher grapes that were then sold to Mayer Hirsh to make Kosher wine. I’m very interested in finding out about Rabbi David Radinsky early life and where he died if anyone knows information. Would love to connect with anyone interested in family history. slatherzberg@comcast.net. I am the grandson of Rabbi Mayer Hirsch’s sister, Sarah Hirsch Allen, which would make Rabbi Hirsch my great uncle. My brother is actually named for Rabbi Hirsch. I live in Denver and would love to connect to any of the Hirsch family who I have not already met during my years in San Francisco.